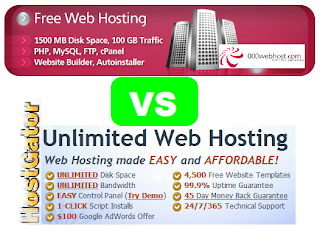 It is ongoing debate on internet about comparison between free web hosting and paid web hosting. When we talk about free web hosting services then it means you have to pay nothing to buy space on internet for your website but it is not reality. You get very limited space and bandwidth with un-availability of various essential features required for an professional blogs but it is suitable for those people who do not want to use it for business purpose and have no intention to make money from their website. When we deal with large business and want to work professionally then it is compulsory to buy web space on internet. Security features Security is problem on internet and paid web hosting companies provide security tools and make arrangements for security of website on internet by providing you domain lock up and SSl certificates. You can install your own design on your website by buying your own space on internet. You also provided with name@yourdomain.com email address to give your site and professional touch. Your site will advertisement free by your web hosting providers and you can attract unlimited visitors to your compang by using paid web hosting. Your website is also verifiable by Google webmaster tools and other search engine optimizer free of cost because Google does not pay value to sites hosted on free web hosting accounts other than on blogger and word press. There are many features required to get traffic including script installers, CPanel, DNS management, Email address management, and web site authorization tools, which are generally not available at free of cost and if available then it offered with lot of advertisement and popups on your website. Some paid web hosting providers like HostGator and Bluehost also provide Google Adwords and yahoo ads packages to their clients which help you to quickly get huge traffic from search engines. Search engine optimization is very important in website hosting and publishing because without proper SEO techniques usage you cannot get traffic for your blog after Google penguin update 2013. Paid web hosting allows you to optimize your website for SEO, which is problem with many free web-hosting companies. Paid companies provide fast server speed and your webpage loads faster but on free accounts it is very slow server speed and these websites usually punished and penalized by visitors and search engines due to very slow loading of their web pages Disadvantages of Free web platforms. Free web hosting companies offer lot of advertisement on your home page and other pages without your permission and it cause difficulty for visitors to find actual content on your website. You cannot transfer your webpage to your new domain because this feature is not available on free account and is very important feature in domain and hosting industry. There many other lot of disadvantages of using free web hosting accounts including lack of existence of backlinks, no custom error page available and many others. If you want to make single page webpage for your personal use then it is suitable to have free hosting account but for professional, business and make money online use then it is strongly recommended to have an paid web hosting account for your website. Now its depends upon you that which type of hosting is best.